Daddojanam/Tempered Curd Rice | The Flavor Nook! 1. Cook rice with about double the amount of water (3 cups here). 2. In a separate bowl, take the curd and add about 1/2 cup of water. With a basic churner, mix the curd well so that it is smoothed without any lumps. 3. Now, add salt to the curd and mix well. 4. In a small pan, heat about 2 tsps of oil, add cumin seeds, mustard seeds and urad dal and roast for a minute or two until they start to splutter and urad dal is pale brown. Now, add the dry red chillies and curry leaves and further roast for a minute. 5. Now, add this popu/talimpu/tempering to the curd and mix well. 6. 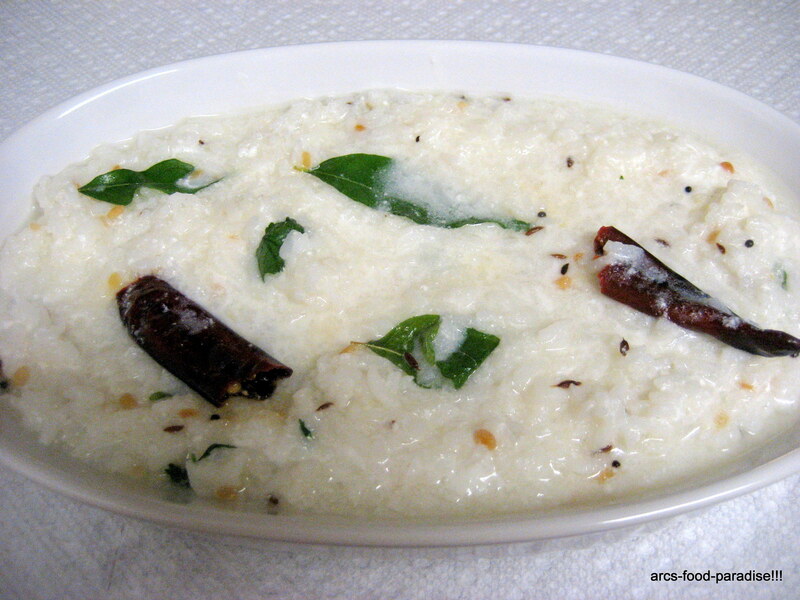 Once, the rice is cooked, mix this tempered curd to the rice and Daddojanam is ready! 7. You, can have it all by itself or any curry and indian pickles.